Size Chart | Size not in stock? Get a discount for bundling these related products! 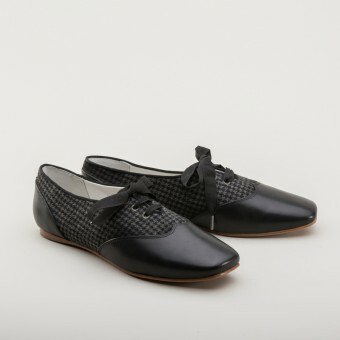 Eliza Early Victorian Shoes are a wonderful addition to any ladies' daywear costume of the early to mid 19th century. 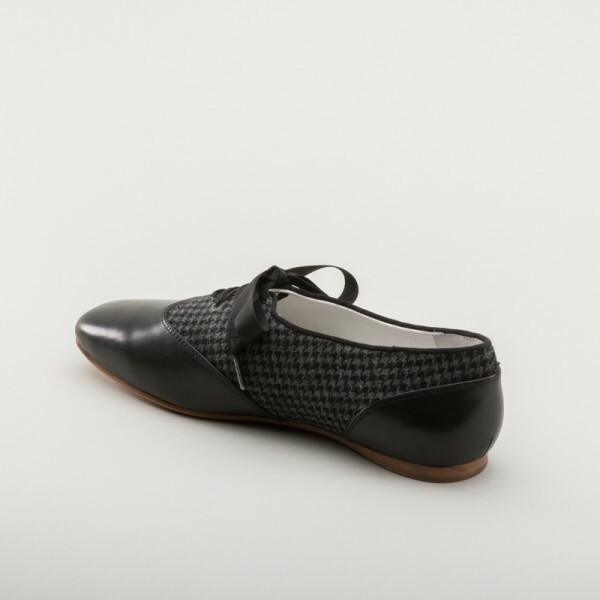 Based directly on extant examples of foxed low shoes from the 1830s to the 1860s, Elizas offer the unique look and style of original ladies' early Victorian footwear with the comfort of modern shoes. 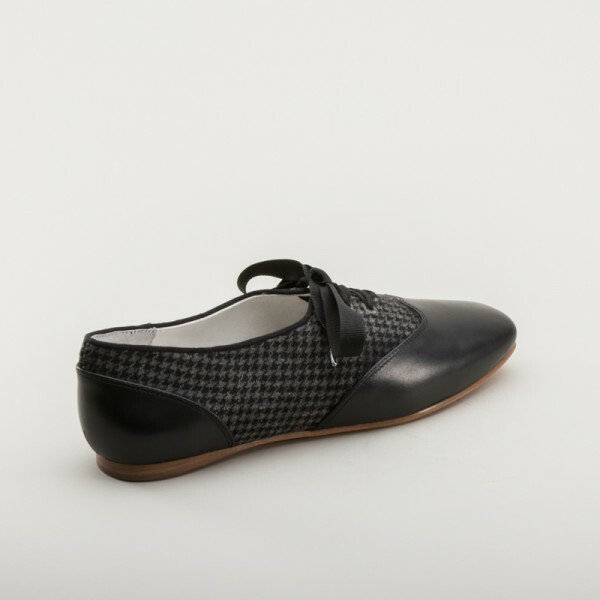 The houndstooth upper is foxed with calf leather on the heels and square toes, offering protection from wear while remaining feminine and attractive. The split vamp lacing closure allows adjustability for all insteps, and the leather soles make Eliza Early Victorian Shoes great for your Romantic Era, Victoria, Dickens Fair, and early Civil War events. Returns and exchanges: You may return shoes for absolutely any reason at all within 30 days of receipt for your choice of exchange, store credit or refund. See our Returns and Exchanges policy and Safe Shopping Guarantee for more information. Split-vamp lace-up closure features stitched eyelets. 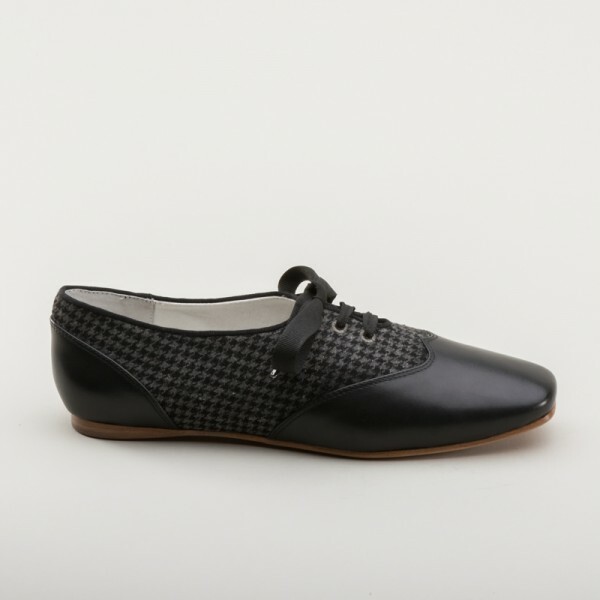 Elizas do not have toe boxes - toes will fit long and flat. B width - ladies needing a "C" width fitting should order a half-size larger. You can find a full sizing chart and fitment advice or more information about materials and product origins behind the MATERIALS/SIZING tab (above this description). Sizing Trends Runs true to size for most customers. We strongly recommend purchasing your usual shoe size (unless you have a wider foot in which case we recommend ordering 1/2 size larger than usual). Color Grey/Black houndstooth check paired with black leather. Assembly With pride by our team of skilled shoe masters in our dedicated (and ethical) production facility in Guangdong. Find out more about why we manufacture in China? "Eliza" Early Victorian Shoes (Grey/Black)(1830-1860s) has an average rating of 5/5 from 2 reviews. Please write a review of this product, help others make a better buying decision by sharing your thoughts about this product. You'll pay nothing if unauthorized charges are made to your credit card as a result of shopping with us. All of your sensitive information is encrypted with SSL technology. Total satisfaction, return anything for any reason at all! We want you to be delighted with your order. However, if you're not 100% satisfied with your purchase you can return any part or all of your order a refund, a store credit, or an exchange. Easy payments over 3 months. No credit checks. 0% interest! Easy Pay is a layaway program offering a flexible, affordable way to pay with your choice of 3 or 6 easy payments. It's available on everything we sell!. Spend $165 and your order to any address in the USA ships free! Small items ship from just $2.60, anything else ships anywhere in the USA for a flat rate of $6.95! Low cost shipping is available for international orders. American Duchess is a small, historical, reproduction footwear company based in Reno, Nevada, USA. It was born from one costumer's inability to find elegant, affordable, comfortable and historically accurate footwear. Partnering with a community of hundreds of frustrated costumers around the world, we now manufacture a growing line of beautifully hand crafted Renaissance, 18th Century, Regency, Edwardian and Victorian shoes as well as reproduction shoe buckles and silk stockings.